Virtually all physicians treat their hypertensive patients who are 80 years old or more. The evidence for the effectiveness of this treatment in very old patients has up till now been lacking. The New England Journal of Medicine has published a paper, Treatment of Hypertension in Patients 80 Years of Age or Older, that shows a benefit of treating hypertension in octogenarians. The paper claims a little more than it actually demonstrates by pushing some of its conclusion a bit past the usual 5% likelihood of chance typically used in scientific papers. For example, it says that there was a 30% decrease in fatal or nonfatal stroke; p= 0.06. The patients in the study were all 80 years old or more and had a systolic blood pressure of 160 mm Hg or more. The were randomized into two groups of about 1900 patients each. One group was treated with a placebo while the other received the diuretic indapamide. The treated group also received the angiotensin converting enzyme inhibitor perindopril as needed for additional blood pressure control. The controls received additional placebo. As can be seen above blood pressure fell more in the treated patients than in controls. 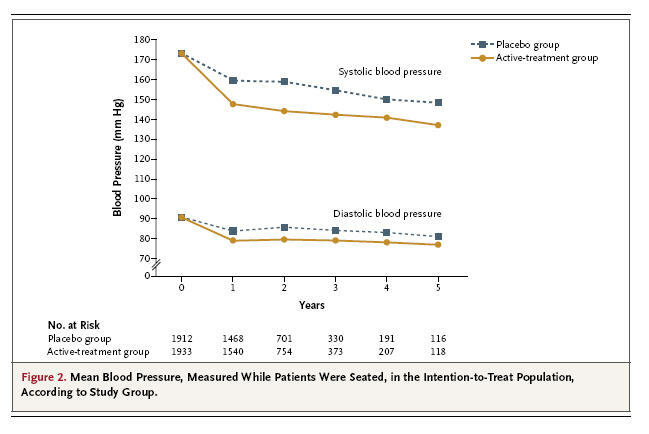 But also note that there was a large drop in the blood pressure in the placebo group. Also note the absence of error bars for each point. There was a large standard deviation for each point which would have diluted the case the authors were trying to make, ie that the positive outcomes noted were the result of blood pressure lowering. The paper does not mention if there was a statistically significant difference in the blood pressures between the treated and untreated groups. Instead they say that there was a statistical difference in the number of patient who reached target blood pressure; less than 150 systolic and less than 80 diastolic. Twenty percent of controls reached target blood pressure compared to 48% in the treated group (p<0.001). 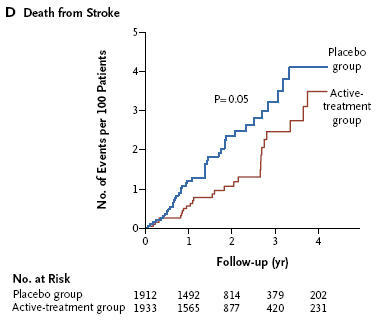 Other significant findings in the study were a reduction in all death from stroke and all cause mortality. The most striking finding, which was of far greater significance both statistically and clinically, was the reduction in heart failure events. This finding is so important that it alone would justify treating 80 year olds with antihypertensive medicines. But which drugs should the physician use? Here the interpretation of the study gets a little cloudy. Diuretics and ACE inhibitors lower blood pressure. Hypertension is the leading cause of heart failure. So lowering blood pressure should reduce the incidence of heart failure. But these drugs also have a favorable effect on heart failure which goes beyond their effect on blood pressure. It is possible that at least part of the reduction in heart failure events noted in this study is the result of the drugs studied and would not be fully duplicated if blood pressure were lowered to the same degree by drugs of other classes. Thus all one can conclude is that diuretics and ACE inhibitors are beneficial when given to very old hypertensive patients. Whether thiazide diuretics would produce the same result seen with indapamide also is uncertain. All ACE inhibitors seem the same, so I think other ACE inhibitors would be just as effective as perindopril. Why the authors of this work chose to use indapamide and perindopril which are not as widely prescribed as thiazides and other ACE inhibitors is not clear. It could be related to the study’s sponsor Servier which makes indapamide and perindopril. My guess, but it’s just that, is that thiazides and any ACE inhibitor would produce the same result. Interesting observations, however, I would like to know if this publication changed the way you use to treat frail elderly people. It did not change mine, since I have had a target of 140 to 160 mm Hg systolic BP in very old people (data from Finland and other european publications showed a higher mortality when SBP was excessively corrected). It is also important to consider that this population was a healthier >80 y/o’s. 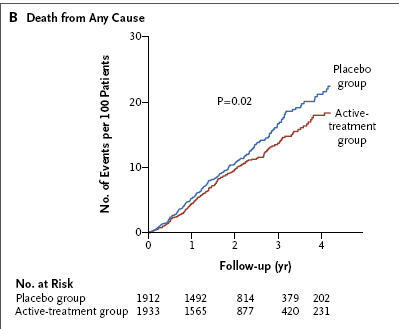 Do you have any clue why BP was reduced by 13 to 19 mmHg in placebo group? As I said at the beginning of the piece, I didn’t think the study would change practice patterns. Rather it provides some good support for what we’ve all been doing. I don’t use any target for treating blood pressure in the very old. The existences of a J curve has been hotly debated. What I do is lower blood pressure to as close to normal as I can get it without compromising cardiac, cerebral, or renal function. Admittedly, rarely do I get it anywhere near 120/80. As for the placebo effect, it is so strong that it’s hard to tell antidepressant drugs from placebos. 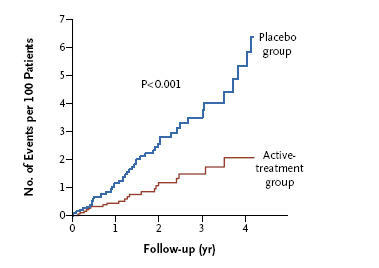 I also suspect that the strong placebo effect in this study was partly due to the patients receiving regular medical attention regardless of what drug they were administered.